If you were an immigrant coming to New York at the turn of the century, Yankee Ferry would have been the last boat you’d have seen before stepping onto New York soil. Though she was originally built as a ferryboat for the Calendar Islands off of Maine, she moved to Boston Harbor during WWI under the command of the U.S. government as a watch point for German U-boats. After that, she spent time in WWII and off the coast of Block Island before making her way back to New York in the hands of a private buyer. Yankee Ferry has definitely seen her fair share of interesting characters, heard more than a few crazy stories, and outlived all others of her kind to claim the title as the only surviving Ellis Island Ferry. These days, she’s home to Josh Rasp, a self-described nomad, who’s been living on Yankee for over a year. The current owners, Richard and Victoria, have turned Yankee into housing for a chicken coup and a sustainable garden as the next stage of her life begins. Visit Yankee at sunset and learn about her incredible history over dessert with the boat team. 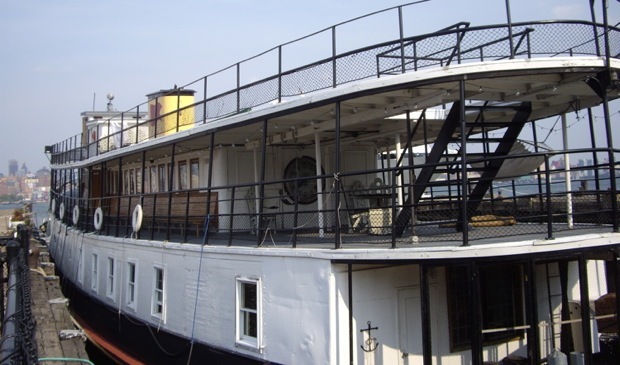 You’ll take in amazing views of the Manhattan skyline while you tour the 4 original decks that used to hold up to 2000 passengers. You’ll also see the 120 tires that are geometrically placed to look like polka dots from the top, but are actually filled with vegetables and plants including heirloom tomatoes and summer squash. A true step back into the past, this experience will leave you eager to learn more about New York’s deep and interesting history. The tour is Sunday August 12 and leaves from Hoboken, New Jersey.